I remember when H.L. Hall called me, sitting in my apartment in Austin back in 1997. As the JEA president, he was looking for an editor for the JEA publications, then Communication: Journalism Education Today and NewsWire. I was excited and honored. 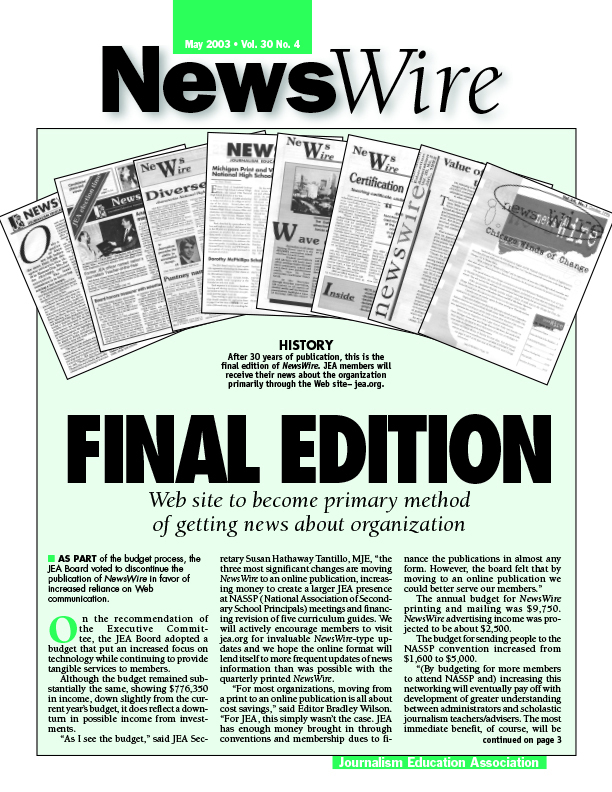 In the fall of 1997, I started editing NewsWire. In his column in that issue, H.L. 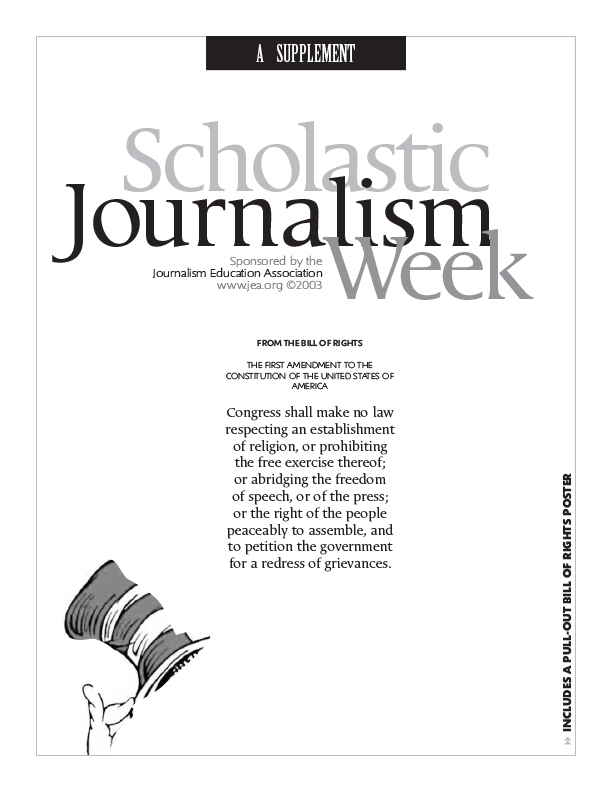 said, “Since the last issue of NewsWire, several JEA positions have been filled. Bradley Wilson, assistant academic director for the University Interscholastic League at the University of Texas, will become C:JET editor beginning with the spring 1998 issue. He is replacing Molly Clemons, assistant principal at Truman High School in Independence, Missouri. Clemons has held the editor’s position for nearly 15 years. And he set four goals for the organization. 4. To foster an organizational outlook which encompasses diversity yet builds unity. And in that same issue of NewWire, Linda Puntney reflected back on her first few years as executive director. 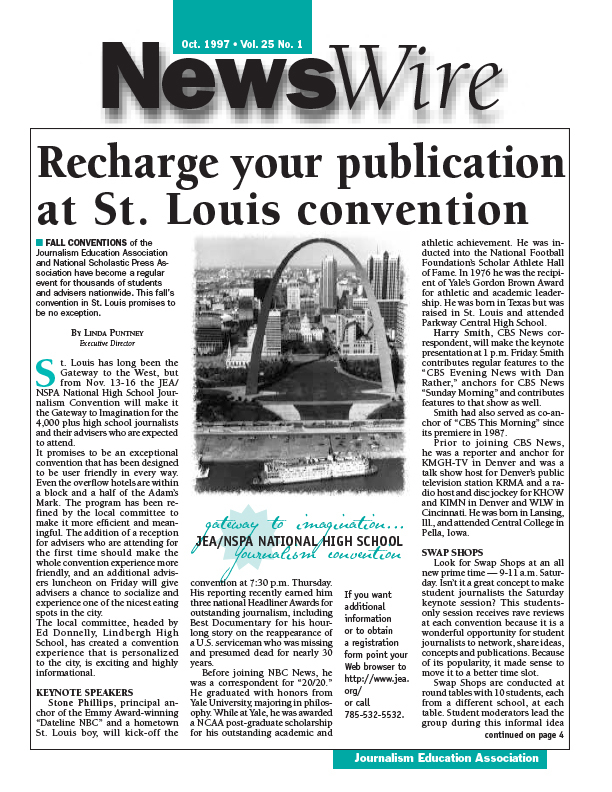 “Going to St. Louis for the fall JEA/NSPA High School Journalism Convention is a full-circle experience for me. The last time the convention was in St. Louis — in 1989 — I attended as the new kid on the block. 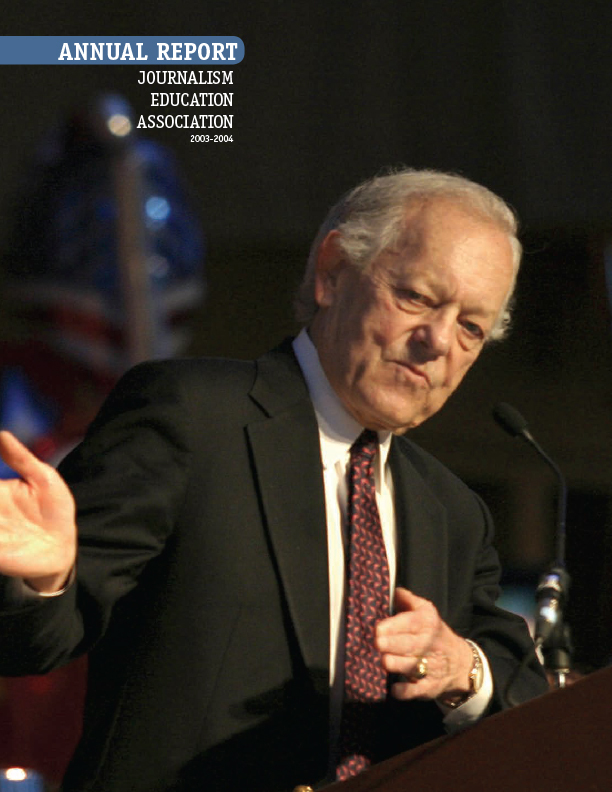 It was my first convention as JEA executive director–actually it was executive secretary then,” Puntney said in her column. I miss seeing so much of Linda. She continues to be a fresh face at the conventions and continues to be a mover and shaker in the world of yearbooks. And I have to admit that there have been some real memories associated with the magazine. Watching some new leaders come (and some go) has always been rewarding. It’s one thing to help college students develop their leadership abilities every day in the classroom or as a student media adviser. It’s another thing to work with true leaders and watch them evolve, grow and change. From his time on the Certification Commission through his second term as JEA president, Mark Newton, has certainly pushed the organization forward. Together with Sarah Nichols, they have a vision for the organization and for scholastic journalism and want to see both thrive and grow in ways many members have never thought of. And realistically, there were way more contributors than the statistics show. Those are unique contributors. A few people have contributed more than one significant item to the magazine. And many, many others have served as sources. Perhaps the most valuable, single contributor over the decades has been Howard Spanogle. I vaguely remember why he started. It was after the spring 2000 issue, an issue that just didn’t get a good set of eyes. So Howard volunteered to be those eyes. It was in the summer of 2000 that Howard was first listed as copy editor. In fall of 2010, we gave him a new title given his expanded help with the magazine in helping to find stories and even produce more content on his own. Connie Fulkerson — who had been another set of eyes on the magazine for years — became officially listed as copy editor. Both constantly push to make the magazine better, questioning everything from commas to photo placement to story ideas to basic coverage. One of the most memorable involves Linda’s husband Martin and our issue produced in cooperation with the Association of Food Journalists, vol. 35, no. 3. I was working at Kansas State at the time but wanted my advanced photojournalism class, with nine of the best college photojournalists I’ve ever known, people like Evan Sémon, Kelly Glasscock, Matt Stamey, Jeanel Drake and Karen Mikols. Their assignment was to find a recipe, buy the ingredients to make it, make it and then take a photo of it. But food photography isn’t easy, and, clearly, some of these students hadn’t cooked much before. I planned to do it at my apartment, but Linda insisted, in a way that only Linda can, that we use her house. I tried to say no. Repeatedly. But off to Linda’s house we went. And into her pristine kitchen we went. Unbeknownst to Martin. By the time he came home, every dish in the house was dirty and piled up 3-feet high in the sink. We had tracked food into the dining room. And on top of that, one of the photographers used one-half a CUP salt instead of one-half of a TEASPOON. Geez. “Oh, don’t worry, we’ll clean it all up,” I said. “Get out,” Martin stated more firmly. By this point, the students had gotten the message and were packing up. Quietly. Oops. We screwed up. But we left quietly. And despite my best efforts to have a fun issue that was packed with information useful to busy advisers, even Howard Spanogle initially though it was a joke. Won’t do that again. Still, along the way I’ve been involved with quite a few fun projects to the JEA magazine. 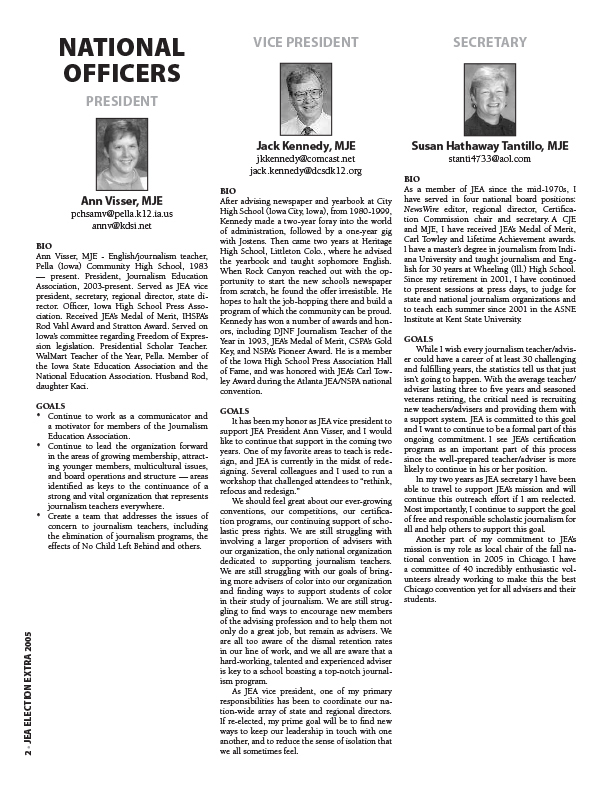 And I look forward to another 15 years of watching JEA, its membership, its leadership and its publications evolve. The 2004 annual report began as an insert to NewsWire and for two years, 2004 and 2005 was published as a standalone publication. For the 2005 and 2007 elections, JEA mailed an election supplement to members. Prior to this, candidate information was published in a NewsWire supplement. More recently, it has been published online. Special issue revised 2002. View the special issue on issuu.com. 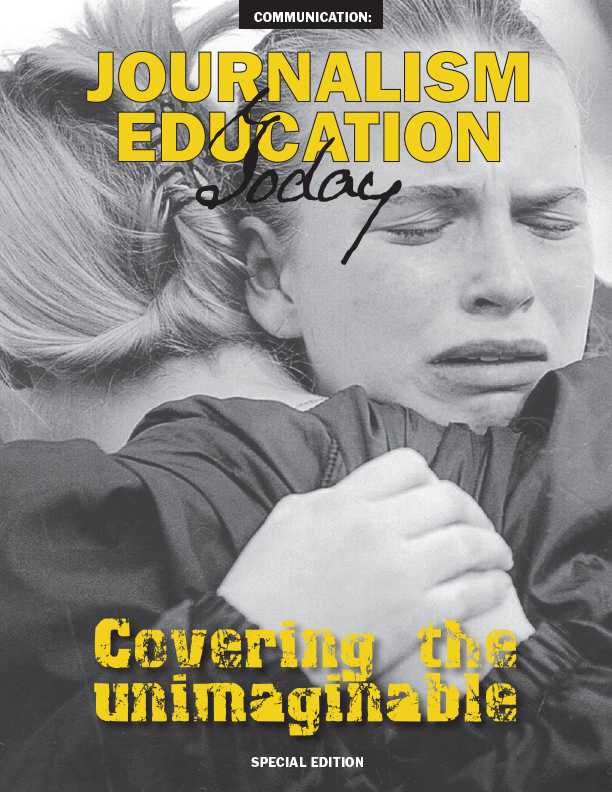 Includes tips on covering everything from tornadoes to suicides in the scholastic media.